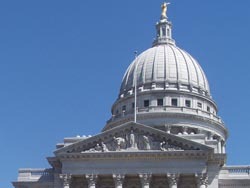 The state Senate is scheduled to vote on the budget Wednesday. Senate Majority Leader, Wausau area Democrat Russ Decker, is still lining up votes and preparing amendments to the budget. "I think we&apos;re getting closer," Decker said Tuesday. "We&apos;re narrowing it down and working out some compromises." Decker&apos;s Democrats hold an eighteen to fifteen majority in the chamber, so they don&apos;t have a lot of wiggle room, and Minority Leader Scott Fitzgerald insists Democrat Senator Jim Sullivan, is not voting yes. "I would say it&apos;s kind of common knowledge that that caucus has let him off the hook," Fitzgerald said. "So I think anything that&apos;s going on behind closed doors right now is to probably twist the arm of one other senator." Fitzgerald said Eau Claire area Democrat Kathleen Vinehout&apos;s support also appears uncertain. "I was in Eau Claire last week and the assumption up there, based on what I read on the front page of the Eau Claire newspaper, is that Senator Vinehout&apos;s voting no." The Senate is taking up the version of the budget that came out of the Joint Finance Committee – not he version which passed out of the Assembly early Saturday. Decker says that Republicans are welcome to participate in the resulting conference committee, but Fitzgerald is not optimistic about that. "The idea that this whole thing is created behind closed doors and then they&apos;re going to hold a conference committee in public? We&apos;ll see what it is. It&apos;s probably going to be a dog and pony show." If the conference committee completes its work this week, a finished budget could be on the governor&apos;s desk by next week.